I have always been a huge fan of the CBS news show 60 Minutes. To this day, there are some indelible segments that have stayed with me, like the Mike Wallace interview with tobacco industry insider Jeffrey Wigand and the Dan Rather expose on George W. Bush and how the 43rd President of the United States of America came to be in the Air National Guard during the time of the Vietnam War. Incidentally, both those segments have been made into films and these days 60 Minutes continues to be a trailblazer in US news reporting, with an analytical twist, though perhaps today they do what they do with a bit more caution. The secret is out, we live in a world that condones a well-respected news anchor on CNN who is caught involved in illegal activities in Central Park and encourages Fox News as they regularly spew out racial bias on their broadcasts, but at the same time condemned CBS for having told the truth -- albeit it a bit rushed and on a deadline. 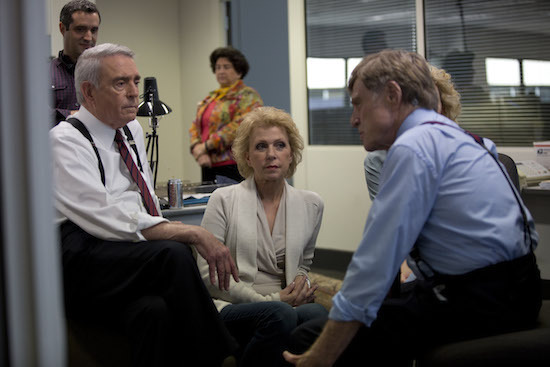 It's no secret that since Dan Rather's resignation, and the firing of his 60 Minutes producer Mary Mapes broadcast news just haven't been the same, ever again. Perhaps the moment in time, in 2004, that is known as "Rathergate" marked the moment in time when the news stopped reporting the truth, if that truth seemed uncomfortable, or worse yet, unprovable. 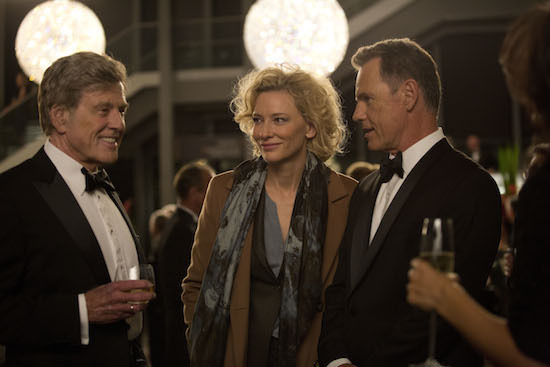 That's the theme of James Vanderbilt's Truth, starring Cate Blanchett and Robert Redford as Mapes and Rather. The film premiered in Toronto, was screened in the US in October and early November and finally landed at this year's Dubai International Film Festival. To say Truth is a masterpiece would be an understatement. Personally, I spent ten minutes following the press screening of the film at VOX Cinemas pulling myself together. Did it touch me deeply because I'm a journalist? Check. Was it so powerful because it tells the story of a woman with courage and who is not afraid to stand up to bullies? Check. But I think the reason the film left me in tears is because it marks a moment in time that changed the world, and those changes have not brought us to a good turn in the road. We are in the chaos we find ourselves in today because we can't handle the Truth. We are so conscious of appearing politically correct with our thoughts and words that we abandon all our ability to make decisions that will affect our safety and wellbeing. In fact, in our search for the ultimate freedom, we have lost it all. Because, as Salma Hayek said to me earlier this year, "Freedom is to have instincts and to have the courage to follow them through, to find the space to stop and just hear your own voice...That's freedom -- that silence." I caught up with James Vanderbilt to ask him a couple of questions about his film, and following are the highlights of a lovely, leisurely and deeply engrossing conversation. With Truth, you do justice to all women who've ever had courage and experienced the aftermath of possessing that quality and being a woman. How did you come on board for this project? James Vanderbilt: I read Mary's book. Vanity Fair excerpted her book, and I was just reading the magazine and I thought the story was fascinating. I remember when this happened in the States, I didn't see the story when it actually aired but I heard about it the next day because it was basically everywhere. But when I read the book I was so surprised by how much I didn't know about the story I thought knew so much about. I thought I knew it much more deeply... There was so much coverage. The other thing is I was so taken by her! That there was this "invisible" woman behind the scenes putting it all together, and to hear her voice. When you read her story her voice comes through, she's funny, and smart and driven and all these great things. So I called my manager and asked to see if the rights were available. He inquired and told me she wasn't interested and I wondered if she would be willing to get on the phone with me. She was, and I said "I know you've not had such great experiences with media, we get it, but I'd love to come down to Texas and talk to you about why this would be a good idea." So my wife and I flew down to Texas, and my wife is this amazing woman who is so much smarter and more interesting than I, sort of like the closer, and we kind of talked Mary into having an option on the book, for a little bit. And that's how it started. Is your wife also a producer on the film? Vanderbilt: No, she's just this really great woman. What one calls the "woman behind the man"? Vanderbilt: Sometimes behind, but also besides and in front of at times! There are a lot of films made these days that point to a specific moment in time when it all went to hell. This theme is present in your film, with regards to TV journalism. Were you conscious you were doing that in your film, and in the script which you also wrote? Vanderbilt: Yes, and a friend of mine calls it the 24 second news cycle, how it's going down now. One of the things that really got me about this story is, it is the first moment the internet really rose up and affected a broadcast news stream story. And everybody, including CBS were so completely unprepared for the speed with which the story was attacked and everything shifted. Suddenly, everything was about the documents. And that's the speed we live with now everyday and we're completely used to it, and this was only 11 years ago. If you look back at the history of journalist it's a fulcrum point and a turning point from how news was given and dispersed before and how it exists now. You also examine the idea of bullies in Truth. Here is this woman, Mapes, who was bullied by her father growing up, and then you place her at this table with her lawyer on one side, and the entire CBS legal team on the other, and she's once again bullied, this time as an adult. How do you prepare for a scene like that, so powerful, do you know that we will feel so much while watching it? Vanderbilt: I'm hoping. I had a wonderful Director of Photography named Mandy Walker and we talked just a lot about what each scene was, and I always had this idea that the shot... That's our action sequence. That's our gunfight. With the production designer we built the table specifically so it's C shaped, it's actually two sides, if they were sitting at one table that's all filled in, I felt it wouldn't have the dramatic feeling of opposing sides... For me it was also, the thing that cracked the movie for me -- because I think movies have to work emotionally or the rest of it doesn't work -- was this is the story of a woman. And the powerful man in your life when you are young is your father. And her father beat up on her. If the most powerful man in the world hit you and you grew up to ask questions to powerful people and when you ask questions about arguably the most powerful man on the planet, who at the time was the President of the United Staes, and your world collapses in on itself, that to me is an emotional journey, story. It has nothing to do with news and journalism, it's a human story. When you watch how Mary and Dan are in real life, he is a sort of surrogate father to her. I'm a firm believer that if you don't get what you need in life the first time around, as a child, you try and recreate it in your work, in your life and in your love life. With the visuals we tried to recreate that. Is journalism today really only an opinion? Vanderbilt: I don't know. I don't think so but I'm just one person. I was lucky enough to have dinner with Dan Rather the other night, and I'd never spoken to him about his time in Vietnam. He spent almost two years there, he sort of invented embedding. He talked about the brutality of this war and I asked him, "you're with this, how do you see that and then go on the air and not go to the place of... these are Americans and I want to kill everybody else?" And he answered, "that's not my job, you have to do your job objectively." We are adults, we have that capability. And part of the reason objectivity in journalism is losing ground is because it's not rewarded anymore. Images courtesy of DIFF, used with permission.